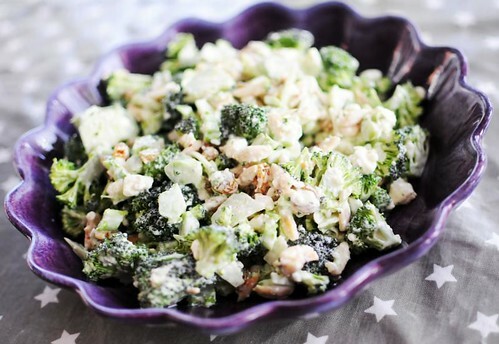 You already know I love broccoli slaw, but I had to share this great variation as well. It's simple, but oh-so-good: it has feta cheese instead of onions! A quick sketch - raw broccoli, both florets and stem, thinly sliced. A handful of yellow raisins. Some toasted almonds, chopped. Crumbled feta cheese. For the dressing, combine mayo, white wine vinegar, salt, pepper and a pinch of sugar. I love this! I don't use feta (but will try) and instead of almonds I go crazy with toasted pine nuts. I really like how your recipes are short and to the point! This salad looks and sounds awesome, indeed.